If you have an Youtube account, always upload videos to Youtube and receive quite a lot of feedback on your Youtube video. Then you can make some money from your video. What? Earn money by publishing video? Yes, you can! If you already have an Google Adsense account, you can add Video Unit to your video. Video Units are embedded, customizable video players featuring content from categories, individual content providers, or automatic keyword-based targeting. To setup the video play, you will first need to link your Google Adsense account with Youtube account. If you haven’t had a Google Adsense account, you can register one at Google Adsense website. 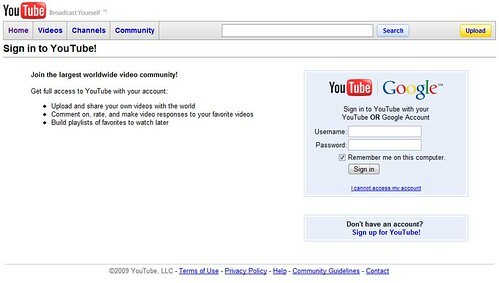 If you haven’t had a Youtube account, you can register one at Youtube website. Fill out the information required, and choose the theme and layout. Choose the content options. If you choose “Automated Content,” Google will fill the player with videos based on the content of your site. You can add keywords to target further. Click the “Generate Code” button to get your HTML code and save the player. Copy the code from the “Embed Code” section and paste it into your website or blog where you would like the player to appear. After you have publish your video on your website, you will start receiving earnings into your Google Adsense account whenever there are clicks on the ads appear on the video. Remember do not click on advertisement of your own Google Adsense account.